Bees have had quite a hard time for a while. For about a decade, they’ve been dying off at an alarming rate. In 2006, beekeepers reported that they were losing between 30-90% of their hives over the winter. What was so alarming was that up to 50% of those hive losses were due to unknown causes. The worker bees were just gone, leaving the queen and some of the brood (immature bees). The hive could not sustain itself without the worker bees, and it just died. There are several reasons that a hive could die off (including acute pesticide poisoning, disease, stress, change in the habitat, poor forage/nutrition, or pests), but this was different. With other causes of hives dying off, there would be many dead bees around the hive. But Colony Collapse Disorder (as it is known now, or CCD) the worker bees abandon the hive and don’t return. Many millions of beehives have been lost to CCD in the last decade. When Colony Collapse Disorder was first identified, the cause was very puzzling. But in the last few years compelling scientific evidence began piling up around a class of insecticides called neonicotinoids. Found in many commercial applications, these chemicals can have lethal effects on bees. Of course there is no one “smoking gun,” but added to the other stressors including other pesticides, invasive parasites, a general decline in the quality of bees’ forage and habitat, as well as climate change, it’s no wonder that honeybees are struggling. This poses pretty serious problems. There has been a heavy economic impact caused by Colony Collapse Disorder. About 30% of American crops rely on honeybees for pollination, and up to 75% of the pollination of food crops worldwide. In other words, without bees, our food supply is threatened. Every third bite you take is dependent on honeybees. In the spring of 2015 President Barack Obama unveiled a plan to improve bee health and habitat (restoring 7 million acres), and spending $82.5 million on honeybee/pollinator research. Clearly this is a problem that needs attention. But it’s not just the government that needs to do something. We too need to make changes that can help to save the bees. Plant an organic garden, flowers, bushes, and trees. Don’t use insecticides, particularly neonicotinoids. If you spot a bee swarm, call a local beekeeper to remove it instead of killing it. You’d be surprised at how many people are into bees! Josh, our own Grocery Buyer, is a backyard beekeeper, and rescues a swarm or two each spring. This year he even captured a swarm in our Ventura store parking lot! Learn more about bees! Your local beekeepers would love to teach you all about bees! Lassen’s is proud to support two incredible bee-loving organizations — HoneyLove in the LA area and Central Coast Beekeepers’ Alliance in the San Luis Obispo area. Explore their websites! 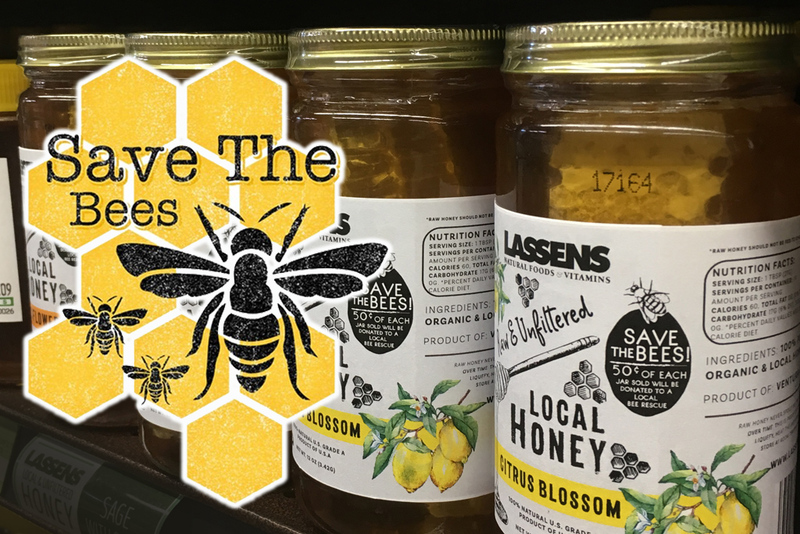 We have our own Lassen’s local honey, and with the sale of each jar we donate 50c to our local organizations to help save the bees! So help us support these great organizations, and look for Lassen’s Local Honey! Below you will find some movie trailers about bees that you might find interesting. The more we know, the more we can help save the bees! I want to use local honey. I love what you stand for. Thank you so much! We are very proud of our commitment to our local producers, and very proud of them, too! It’s one of the best things about our business — partnering with people who are passionate about the health of earth, farmers, and people, too! Thanks!